Happy Tuesday, My Lovelies! I have autumn fever. It's like spring fever: I've been playing outside in the sunshine and getting very little accomplished! I'm still trying to finish decorating for fall, but I haven't really gotten past the kitchen yet. Maybe this afternoon I can get down to business because the heat will be returning! I am getting flowers ready for the family room, but I need to take out summer decor before I add autumn decor. This simple arrangement of roses in a MacKenzie-Childs flower frog is ready to go! Yesterday I was running errands and I kept seeing Christmas trees. Everywhere. Yikes! 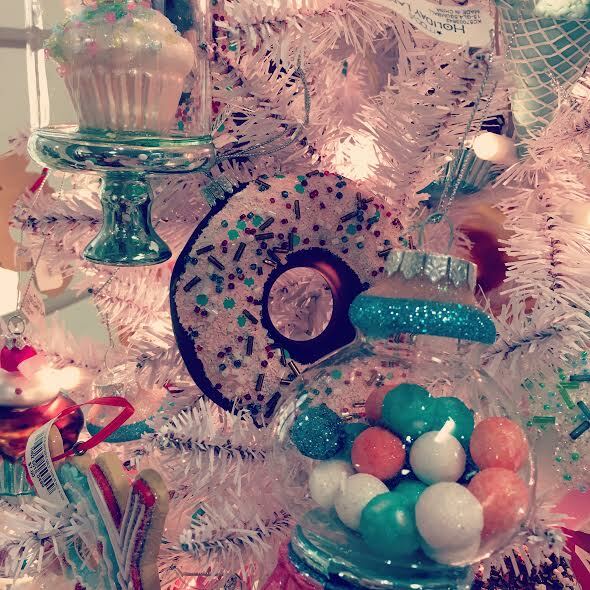 I must admit I love the corals and turquoises on these sugary-sweet ornaments! What happened? Did I miss autumn? Also I've noticed that a few of my favorite stores aren't carrying as many Halloween items as they have in years past. Have any of you noticed the same thing? Not that I mind, really, because Halloween scares me and I like Thanksgiving decor better. 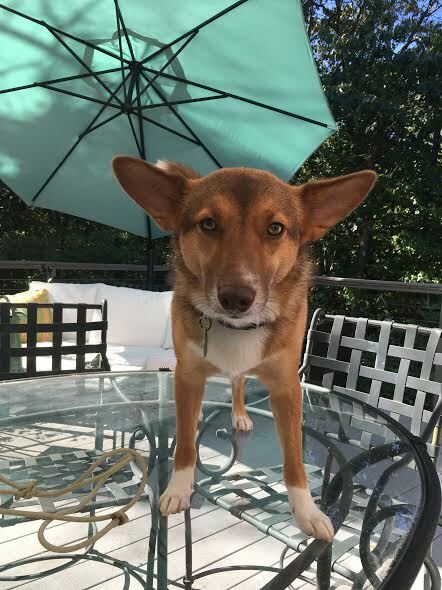 Speaking of scary things, our daughter's dog Lily Potter is visiting, and I can't decide whether she's part fox or coyote. I've been pinning like a crazy woman. I want to share with you two of my favorite pins for autumn. These are my favorite colors. Aren't the painted pumpkins fun! Visit Vanessa at A Fanciful Twist for more. Don't you just love this porch? 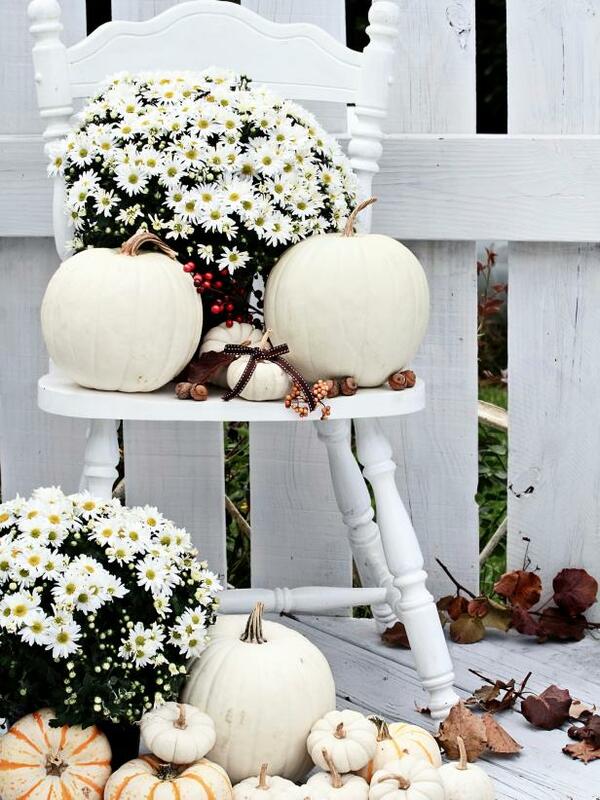 I love the white mums and pumpkins. Notice the ribbon tied around the stem of the tiny pumpkin on the chair! So cute. You can read the article from HGTV, Fall Front Porch Do's and Don't's, HERE. My mailbox has been full of wonderful books. I will continue to review great reads via TLC Book Tours on Friday, but in the meantime I want to share the latest Flavia de Luce mystery here on this post. 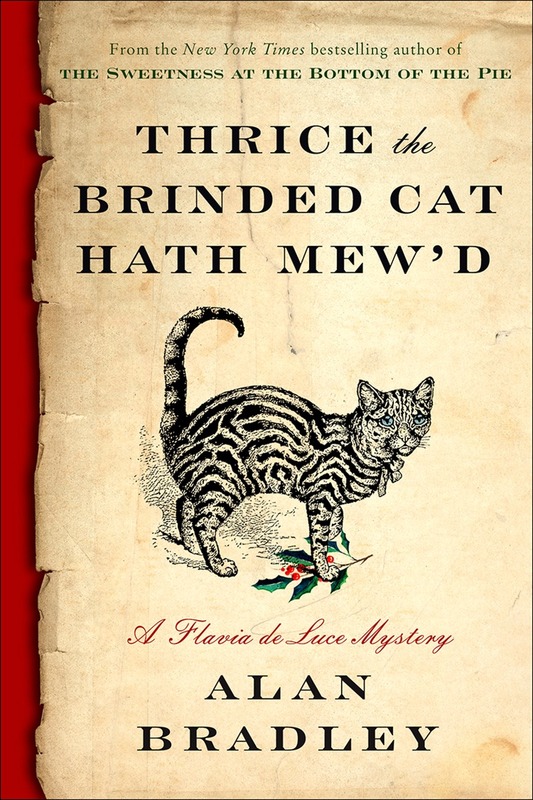 Hailed as “a combination of Eloise and Sherlock Holmes” by The Boston Globe, Flavia de Luce returns in a much anticipated new Christmas mystery from award-winning and New York Times bestselling author Alan Bradley. Acclaim for Alan Bradley’s beloved Flavia de Luce novels, winners of the Crime Writers’ Association Debut Dagger Award, Barry Award, Agatha Award, Macavity Award, Dilys Award, and Arthur Ellis Award. I am a huge Flavia de Luce fan. Although I give this book a five star rating, it isn't my favorite, and I'll get to that later in the review. Flavia is coping with major adult issues as a twelve-year-old: She's a genius chemist and sleuth who solves many mysteries around her sleepy post WWII English village, Bishop's Lacey; She's a member of an ultra-secret British intelligence organization like her late mother Harriet; She's been sent home from a short stint at Miss Bodycote's School for Girls, Canada; She was named Harriet's sole heir of Buckshaw, her family's estate; She learns that her father is gravely ill with pneumonia upon her homecoming. What I do love about this book, like always, is the science and Flavia's uncanny ability to observe and deduce truths with very little time for observation. She remembers details that she draws from later on to solve mysteries. This installment doesn't involve a murder but an accidental death which is a bit different from the other books in the series. I also noticed that Flavia has matured a bit: she ventures out to London on her own in search for answers, and she shows grit and determination as she endures harsh weather conditions on her trusted bicycle "Gladys." I was expecting a story about witches due to the title (the quote is from the Scottish Play, Act IV scene i). There is a slight witch plot point, and there is a little Gothic feel to the book because of the mention of fairies and creeptastic cherubs and gargoyles. I wish this had been developed a wee bit more because I would have liked to know more about the murder victim's woodcarving, especially on his bed. What I didn't like about this book is the ending. I was not expecting it, and Alan Bradley drops this bomb and immediately the book ends. I hope the next book will be available. Soon. 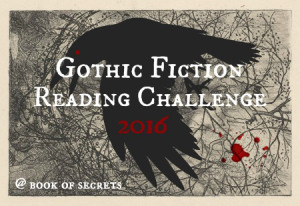 This is another book I can add to my list for the Gothic Fiction Reading Challenge. I'm currently reading a fun cozy mystery that was actually a little more chilling at the beginning than what I was expecting. How's your week going so far? Is the weather lovely in your neck of the woods? ooh, again, I cannot wait to see your whole house decorated...you do such a lovely job of it. I want those ornaments!! lol, they are adorable! your daughters dog is a cutie..how does she get along with your pups? white pumpkins are so pretty..I have not seen any around the stores here..I love having at least two during the season. more books to add to the list...thank you for sharing that. Your decorations are always beautiful! Its sad how fast Christmas decorations are popping up in all the stores! RJ this was a fun post. Fox I think, love Lily's ears. But standing on that table - perhaps part cat. I like you do not like the commercial push to rush Christmas, especially since Autumn is my favorite season. But I do enjoy Halloween and have been adding Halloween décor into my fall accents. I hope to be able to read a few books soon, been too busy writing my fairytale books! Even my magazines are piling up unread, Yikes. Awwww Lily is too cute. She has a very determined look on her face like I am not getting off this table lol! Love all the fall inspiration. Hopefully will get to my porch this week end. Just still feeling like summer here. I enjoyed your pin's. FUN and INSPIRATION! Yikes, that is quite an unusual dog! Good thing she's sweet! 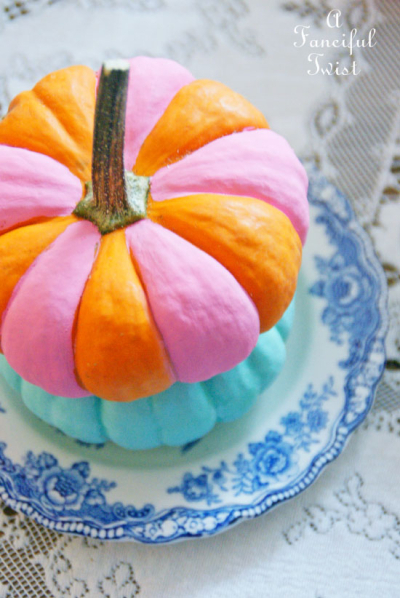 I have been painting pumpkins too, love the orange and pink one! And the blue one! and the pile of white ones on the pretty porch! 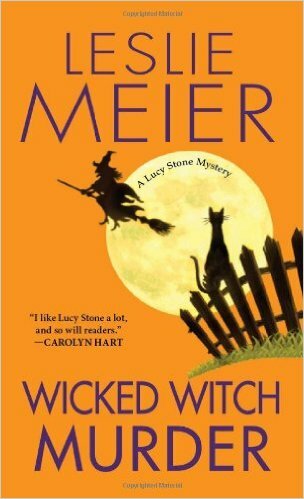 I love pumpkins, sigh....As for the book, it sounds very different, and hard to believe a 12 year old can handle all this... Leslie Meier is one of my favs, both of these books look perfect for spooky October fun! I did a bit of furniture moving and knicknack moving. I got everything just so right in time to make way for fall decor...hope I remember where I had everything! That pic of Lily Potter just made me laugh! I love her name!!! Good luck with keeping her off the table. btw: I figured out my favorite of your glass pumpkins. 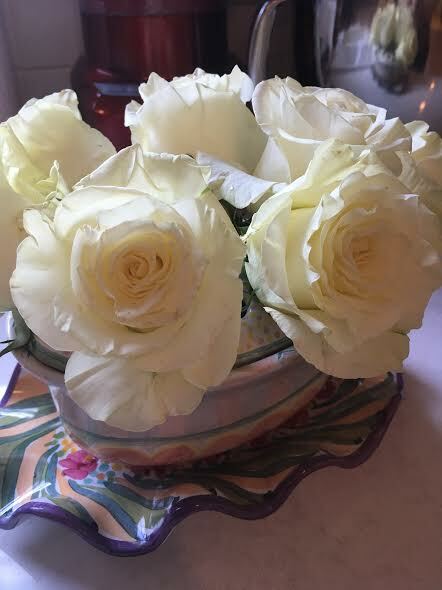 The white one with the green twirly stem. Beautiful!